HACKGATE DAY 205: Slog vindicated as McCartney agrees to talk to police – The Slog. Following yesterday’s suggestion here that Sir Paul held the real key to cast-iron phone-hack evidence against Piers Morgan, the former Beatle has told an audience in the States (where he is on tour) that he will contact the police in relation to the matter on his return to the UK. Culture, Media and Sport Committee Chairman John Whittingdale reversed his previous stance on Piers Morgan last night, and backed calls made earlier in the day by Harriet Harman and Tory MP Therese Coffey for the CNN host to return to Britain and face the Committee. CNN offered a terse no comment last night. But I spoke to McCartney’s publicist Stuart Bell this morning, who confirmed that the rock star had decided to break his silence on the issue. American site Gawker (of which I’m becoming a fan) headlined ‘Piers Morgan is a Lying Liar’ last night, pastiching the CNN anchor’s ‘lying smearers’ gibe of last week. The site then described an e-mail exchange with Meghan McPartland, a representative from CNN: “When I indicated to her via e-mail that Morgan had ‘written in the past about listening into Heather’s voicemail’, McPartland replied: ‘No, he never wrote about listening to anyone’s voicemail. He said he was played a tape.’ Get ready for Watergate-style hair-splitting on a grand scale….briefly, followed by Piers leaving to pursue other mates with his mobile phone. 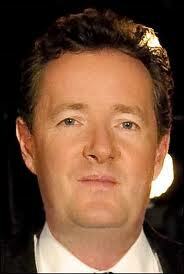 I think we can now fairly safely say that Piers Morgan is a mire organ sap. Although he could yet be saved by global econo-fiscal meltdown: so it is now the duty of all people of good heart and true to save the economic system, and bang Morgan up for as long as possible.